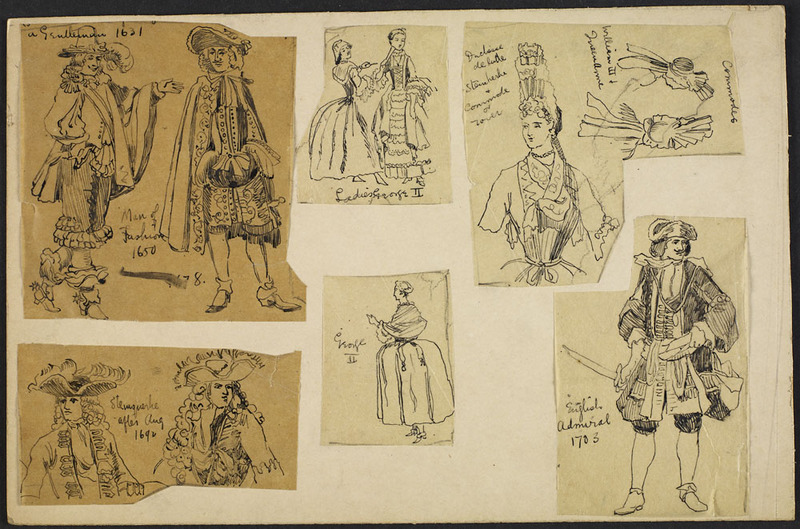 Various Costumes, 1631-1750. By: Charles William Jeffery. Source: Library and Archives Canada, Acc. No. 1972-26-1156. Originally, this exploration of historical Canadian fashion was going to be a one-time Research Q & A post. But when my brother and I started talking about the significance of fashion in Canada; how crucial the fur trade was to the colonization and economic development of New France, it was obvious that another blog series was needed. Unlike the wealthier settlers, habitants’ clothes was either homemade or spun by local weavers. Their working-class attire tended to be on the more conservative side and was similar to the clothing worn in the French countryside. The fabrics used were more durable than fashionable. 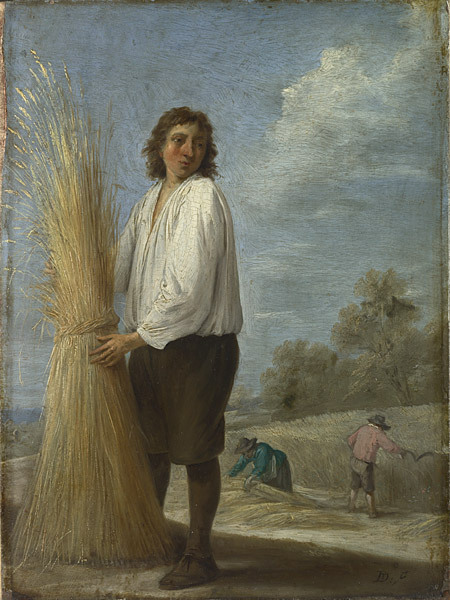 Linen, hemp or coarse wool, often lined with leather or fur for additional warmth, was generally used. Men wore a shift or shirt, breeches with knitted wool stockings, and sometimes a vest or a short waistcoat. They either wore leather shoes with a buckle, clogs, or moccasins. Aboriginal influence on habitants’ clothes was more apparent with men’s fashion. In addition to moccasins, men added leggings and on super humid days, breechclouts (a rectangular piece of fabric held up by a belt), to their wardrobes. Who needs pants! Toques or wide brimmed hats were also worn depending on the season. Like their French counterparts, women were stuck wearing a lot of clothing, even in the summer. Cotton shifts, woolen skirts over a petticoat, wool stockings held up by garters, bodices, bonnets, and buckle shoes or clogs were a part of their daily wear. Dresses, mantles (short hooded coats), and aprons were also in their wardrobes. Aside from also wearing moccasins, the main aboriginal influence on women’s fashion came in the form of the shawl. Fun Fact: At the age of six, children from all social classes were expected to dress like adults. The middle class wore similar clothes to the habitants, however theirs was made of finer, softer fabrics including silk and velvet and came in a wider range of colours. There were some differences however. Men often wore wigs and tri-corner hats decorated with feathers. Their shirts, pants, and waistcoats were more tailored, be adorned with decorative buttons, and the latter would have included embroideries and braids. Around their necks were ties/scarves made of muslin that were knotted in a fashionable manner to rest at the top of heir chests. The inclusion of decorative fashion could also be seen in the clothes of bourgeoisie women. Their blouses had lace collars, skirts were adorned with pleats, their stockings were made of silk, and their aprons were made of lace. Dresses were more fitted, often had short, narrow sleeves, the bottoms were raised and pinned at the back, and a dress coat would have been worn over them. Also, bourgeoisie women would have carried around fans or parasols. 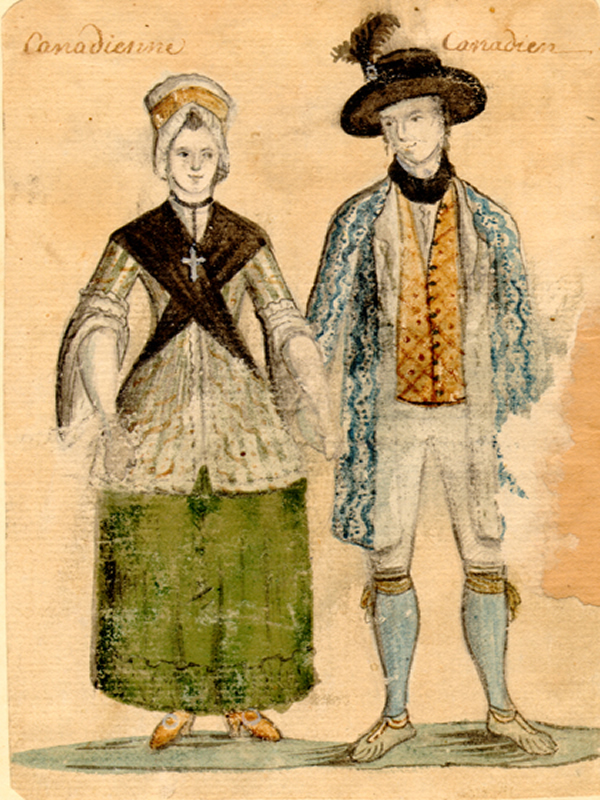 Canadian Couple (c. 1750-1780) by Anonyme. Source: Ville de Montréal. Gestion de documents et archives. Fonds BM7. The nobility were at the top of the social class structure as no royalty ever resided in New France, let alone visited. (Fun Fact: Prince William, who later became King William IV, is considered the first royal person to visit British North America. He visited from 1786-1787 as part of a Royal Navy contingent). 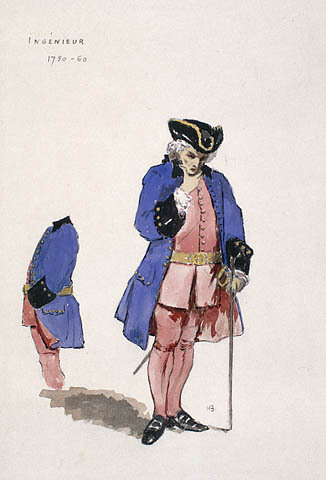 The number of people who made up the nobility class was minuscule in comparison to the habitants as New France was not an attractive place for the French upper class. Lives abroad would have denied them all of the luxuries of their daily French lives that they were used to. Those who left largely did so due to their employment (appointed government or military officials) or (given the lack of other nobles and royalty) to boost their place in society. Generally speaking, the type of clothes they wore were similar to the bourgeious, however things like how the fabrics were cut and the material used set them apart. Like their counterparts in Europe, the nobility in New France wore lavish clothes made with extravagant fabrics and designs. Initially, noble men wore wigs that were so big and cumbersome that their tri-corner hats had to be carried under their arms. When wigs became lighter in the 18th century, the tradition of carrying one’s hat under their arm persisted. Their shirts had lace collars and cuffs, their necks were adorned with Steinkerque lace cravats (ties/scarves). Gold and silver thread was woven into their vests and coats. Their pants, stockings, and shoes were made of silk. They also carried canes and wore gloves. 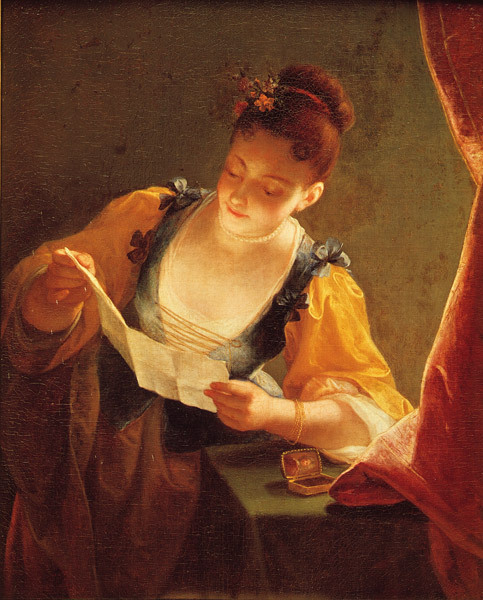 Young Woman Reading a Letter by Jean Raoux. (c. 1720-1730). Noble women’s bonnets were decorated with lace and gems in the shapes of butterflies. Their blouses were adorned with frilled lace and had engageantes style (funnel-shaped) lace sleeves. Their dresses and skirts were decorated with gold and silver thread, floral designs, fringes, and were layered over petticoats. Also, their dresses ended with trains. New France maintained the tradition of equating the length of the train to the level of one’s nobility. Parasols and gloves were a must, as were silk stockings and shoes. Ribbons of gold and silver were extensively popular too for women and men as they were both decorative and practical, (held garments together). 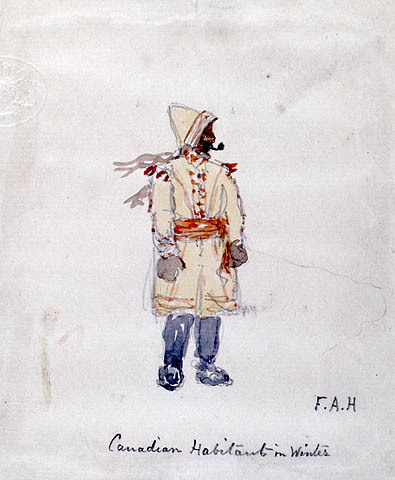 Aside minor details, the incorporation of some Aboriginal fashion, and being a season or so behind the latest fashion trends, by and large the French had similar clothes regardless of what side of the Atlantic they were on. However, you probably can guess what time of the year there was a major exception to this. Turns out snow was the great fashion equalizer among the New France classes and winter is where the biggest leap from French fashion occurred. While those who were more wealthy could have afforded a larger variety of winter clothes, ultimately everyone had to use deer hides and various fur skins for warm coats that could stand up to the cold and moose skin gloves to protect their hands when braving the cold. 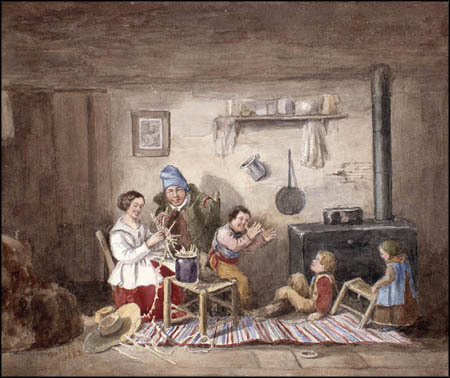 Canadian Habitant in the Winter (c. 1858) by Frances Anne Hopkins. Finkel, Alvin, Social Policy and Practice in Canada: A History. Wilfrid Laurier University Press. (2006). Hamilton, Gillian and Snow, Aloysius, 2007. “Class, Gender and Marriage,” Review of Economic Dynamics, Elsevier for the Society for Economic Dynamics, vol. 10 (4), pages 549-575, October. 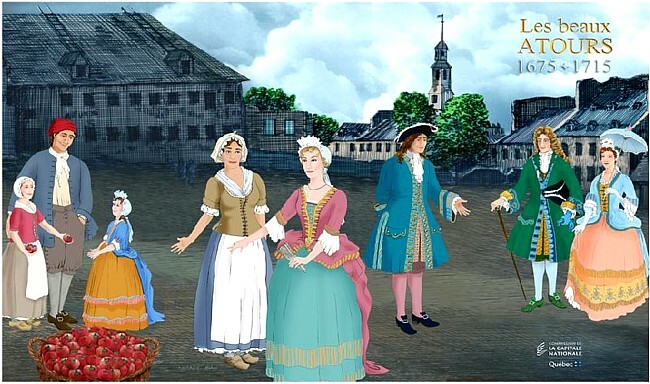 This is very Interesting, I like Bourgeoisie Fashion, their blouses, lace collars and skirts is so different..
Did the Habitant women ever wear the Ceinture Fléchée or was it strictly a man`s item? I know it was often used to keep coats closed in winter so I am curious if women used it in winter as well when they were walking about ? Did habitant and/or bourgeoisie women always wear stays? Aside from providing support for their breasts, stays were seen as a symbol of a woman’s morality and they provided the foundation for the garments of the time to be draped. As such, during formal occasions or when out-and-about in public, both habitant and bourgeoisie women would have generally worn stays, but at home/on the farm it would depend on the individual. For more info, check out Susan Vincent’s The Anatomy of Fashion: Dressing the Body from the Renaissance to Today. Thanks for visiting my blog!